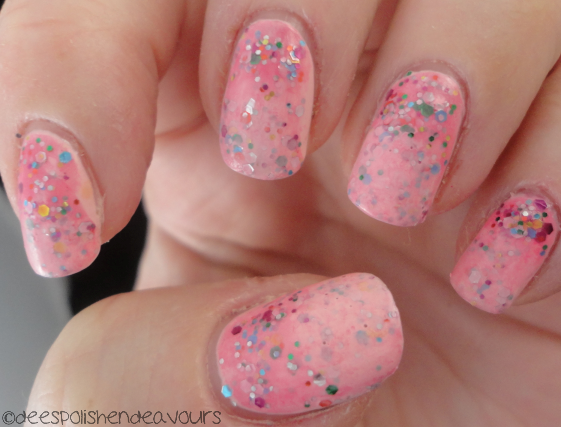 I was really debating whether or not to share this blah nail activity with you all.. but.. I have said before: I don't hide major mistakes from you all.. So, here goes! In my mind this was supposed to look awesome.. But apparently Candy Shop is muchos more opaque than I thought it would be.. The pink shades were so different.. Then it was a sponged mess going on and a solid coat here, and more sponging and then I just said 'enough' and snapped a photo of three. Zoiks. Both of the nail polishes are amazing.. I just wish I would have used them differently.. Well, moving on.. I hope you are all having a great day - and I will see you again tomorrow! !